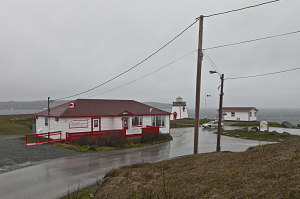 One of the major benefits to arriving in Newfoundland nearly at the tip of its Northern Peninsula was that it was now very convenient to visit the sites around St. Anthony and L'Anse Aux Meadows -- normally a long, out of the way drive for visitors who came in from the south. And so, that was our first set of objectives. Turning north on highway 430 -- the "Viking Highway", we headed towards the town of St. Anthony. 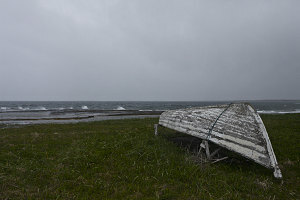 As the ferry to Newfoundland had arrived at St. Barbe, the inclement weather had returned with a vengeance. 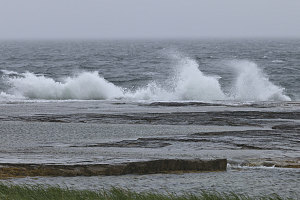 Strong winds created sideways rain, and along sections where the highway was next to the coast, a heavy surf pounded the sea into sheets of spraying water. Temperature-wise, it was pretty inclement, too. I don't believe the high for the entire day reached higher than the single digits (celcius) above freezing. 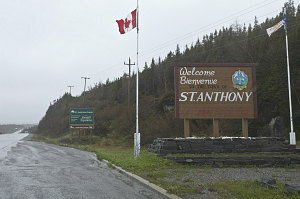 St. Anthony was originally an old French fishing port. Its most significant claim to fame, however, is with the figure of Dr. Wilfred Grenfell. A medical missionary, he did much to promote the welfare of the fishing communities in Northern Newfoundland and along the Labrador Coast. A widely-known missionary was created in St. Anthony, and today a historical society has preserved his memory and the buildings and remnants of the missionary. The Grenfell Estates and its green-and-white clapboard buildings is now one of the area's tourist attractions. 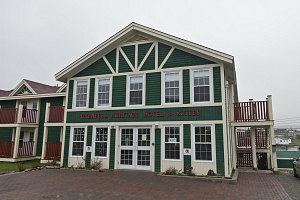 In fact, the hotel that we reserved a spot in is called the Grenfell Heritage Suites. 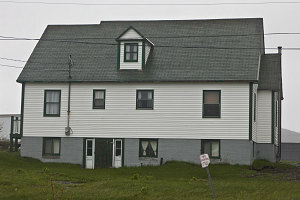 It was a fairly modern hotel by rural Newfoundland Standards. When we arrived in the lobby, glad to be out of the wind, rain and cold, we were suprised to see our motorcycle aquaintainces from the ferry -- Brian and Jenny. Brian had proclaimed the ride from the ferry to St. Anthony to be just about the most treacherous drive of his life, and they were both looking for a warm place out of the rain. Unfortunately, there were no rooms left at this hotel, so they went off in search of other accommodations. Once cleaned up, our thoughts turned to food. 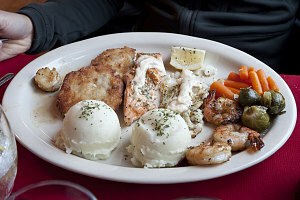 We wanted to sample some of the local seafood, so we picked what sounded like a highly-reviewed restaurant on the edge of town called the Lightkeeper's Seafood Restaurant. The restaurant is located at the end of a road out of town, on the site of an old lighthouse installation, right on the edge of the ocean. 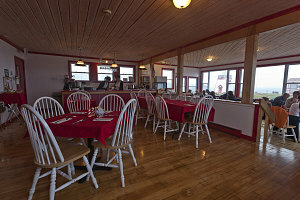 The restaurant itself uses the old lightkeeper's residence, but modernized into a brightly-lit facility, with lots of windows and a distinctive whitewashed-maritime sort of decor. As we waited for our orders to arrive, I decided to head outside for a bit of impromptu photography. 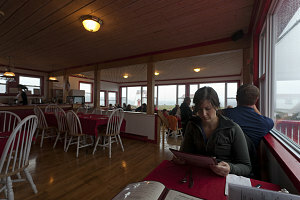 The restaurant, being as it was on a point on the ocean, had a good view of some spectacular rugged cliffs nearby, and the windy and rainy conditions had the sea churning and frothing at their base. 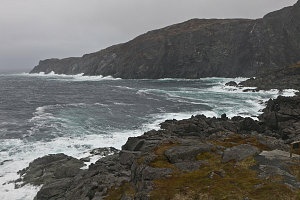 Heading out into the weather and carefully shielding my camera from the worst of it, I made my way over a small rise to a point where I could directly look into the nearby cove and upon the big cliffs above. A small creek poured off the edge of the cliffs, and would probably under more calm conditions have formed a pretty little waterfall. However, today its entire flow was promptly blown away by the strong winds. Now back at the restaurant, we enjoyed a pretty good meal - Jenn's order was a melange of seafood, and mine was distinctly vertebrate-oriented. One of the things we'd wanted to see when touring Newfoundland and Labrador were icebergs. The area around the northern peninsula and St. Anthony is reportedly a good place to see them, but so far, we hadn't. The weather, of course, limited our visibility severely, and for all we knew there was a flotilla of ice just out of sight beyond the clouds and mist. Before heading to bed for the night, we decided to take a look at the sea on the other side of the Northern Peninsula White Hills. A short drive to nearby Goose Gove gave us a view south to Hare Bay. 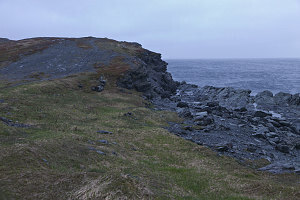 A blustery and wet walk out to Loup Marin Point near Goose Bay revealed a turbulent sea and a wall of white - but no icebergs.